It’s time to introduce to you the new collection designed by Flying Förtress. 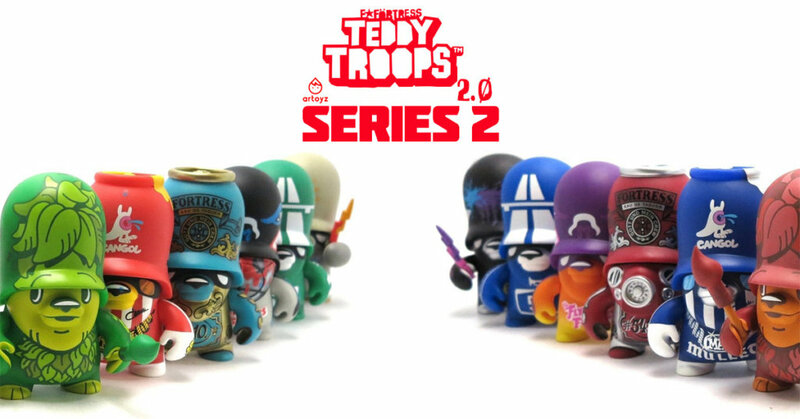 Artoyz presents to you the second series of the Teddy Troops 2.0 with 6 new designs, each design declined in two colourways, a classic and a chase variant. The classic platform makes a return with series 2, with help from our faithful friend Muffin Man. Last year we leaked series one a little too early which you can check out HERE. Fast forward to today Artoyz present to you all series 2! The classic version is limited to 320 pieces meanwhile the chase variant is limited to 160 pieces. To ease the collection Artoyz have decided to pack them in a window box, so you can pick the designs you want. Dirty Basic Trooper features the Basic design so precious to Flying Förtress as this is the original Teddy Troops design, ash first created it. This time he spiced it with some coloured paint splatters. The classic version is a mix of beige/grey meanwhile the chase is a classy mix of black and silver. The Autobhan Trooper is a tribute to the highway network between Hamburg and Paris, that network that makes the connection between Flying Förtress and Artoyz! The classic blue version goes from Hamburg to Paris meanwhile the green chase links Paris to Hamburg. The Greenling Trooper is a reference to Greenling, a vegetal character created by Flying Förtress. We found this character is many of his works, especially those made when he was in New Zealand. Greenling features a lettering that says TREES GROWING DON’T DISTURB and a pencil as a new accessory. The classic version is green as spring and the chase refers more to the autumn. The Vampire Bats Trooper features one of the most famous Flying Förtress design as you may have seen it years ago in Fatcap Series from Kidrobot. The designs are now a B52 with vampire bats paintings, a bloody bow window and some specific wings. The classic version is grey and black colours and the chase one which has more some kind of sunset feeling.